Put order in your notes and idea's! Did you ever save some information on your hard disk and forget where? Well I did! Therefore I wrote a program that stores information in a structured way. The information is stored in a tree structure. So it can be easily retreived. 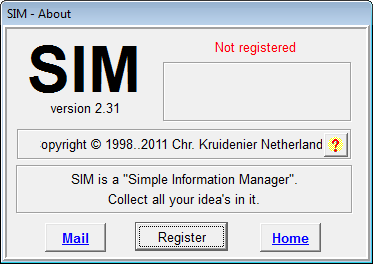 SIM is the name of that program, it is a Simple Information Manager. It runs under W95/98/00/NT/Vista/7. The Demo version can be downloaded free and is fully fuctional during 30 days. 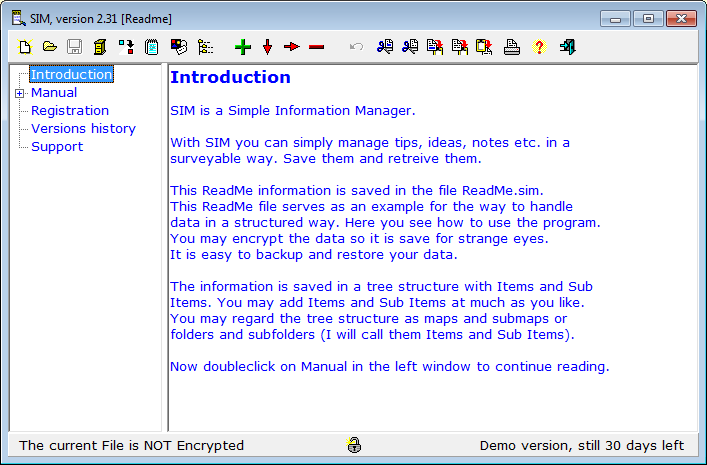 The included ReadMe file is an example file for the way SIM works. Registration costs only US$ 10,-. You will get an unlimited fully functional program. You will be alerted of important updates by e-mail. Registered users may download them freely. View the .xml file and the .htm file. At startup of SIM you will see the Main Window, divided in two parts. At the left, in the Items Window, is the tree structure, at the right, in the Contents Window, is the information corresponding to the selected item in Items Window. The default filename of the SIM data file, with all SIM data is called "sim.dat". SIM automatically reads this file at first startup. In order to open another file, use this "Open" button. Note that SIM will remember the last file read. So to see "sim.dat" at startup again you will have to open it before closing SIM. Create a number of shortcuts to SIM on your Desktop to easily access a number of different data files. Click the Update Button to create a shortcut on the desktop to the current data file. Click the "Save" button to save your data. Every time the data is saved two old versions of your data are saved too. Click the "Backup" button to Make Backups of your data files or Restore them. Click the "Backup" button to check (if an internet connection in active) for the availability of a newer version of SIM. With this speedbutton you may put a Shortcut on the Desktop. Clicking this Shortcut starts SIM with the current Data file. In this way you may put a number of Shortcuts on the desktop to easily access your favorite SIM files. It is wise to make frequent backups of the data files. As you see, I entered "D:\My Dropbox\UserData\SIM\" as the location for the data files. All files in the "My Dropbox" folder are automatically backed up to the servers of Dropbox. So if your hard drive crashes the files aren't lost. You get 2 GB free of space at DropBox. If you create a free account, using this link, you (and I) will get 0.5 GB more of free space. Check "Create a new item from Clipboard" to paste a new item to SIM. When adding or appending a new item in the Items Window, the contents of the Clipboard will be copied to the corresponding Contents Window. Check "Expand on Read In" to expand the tree when reading a Data File. Check "Encryption on" to encrypt the current Data File. In this way you may use SIM to remember all your Usernames and Passwords. You may also click on the padlock on the status bar in the main screen to put encryption on or off. If this item has been checked then SIM checkes if a newer version is available. If yes, it may be downloaded. In this Box you may select the type, size or the color of the text in both text windows. In this Box select the right language for SIM. Check "Use System Language" to select the language the computer uses. Check "Use Dutch" to use the Dutch language. Check "Use English" to use the English language. - Click this item to get information about the program and the autor. Click the Exit Button to end the program. For your safety a window apears where you can save the changes, discard them or return to the program. N.b. 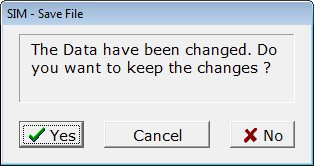 this window only shows if the data have been changed. The demo of the program SIM is free. If you like it please register the program. For only US$ 10,- you get a fully functional program and you will be notified of updates and bugfixes. You can always download the latest version enjoying most of your registration. The small fee for registration enables me to continue improving the program. The demo is free. You may try the program without any risk; it can be simply removed from your computer (Start | Configuration | Configuration window | SIM => Click the Add/Remove Button). Click "OK" and downloading starts. The file "sim233.exe" wil now be saved to the directory "c:\Temp"
Now follow the directions in the setup program to install SIM on your computer. Anything to tell? Please send an e-mail.